Uzbek President Islam Karimov has warned of war if upstream countries Kyrgyzstan and Tajikistan pursue power generation projects that might alter, or make open to political manipulation, the supply of water needed to irrigate Uzbekistan’s cotton crops. Public anger over a decline in basic services fuelled the unrest that led to the overthrow of President Kurmanbek Bakiyev in April 2010. (See our report Decay and Decline.) 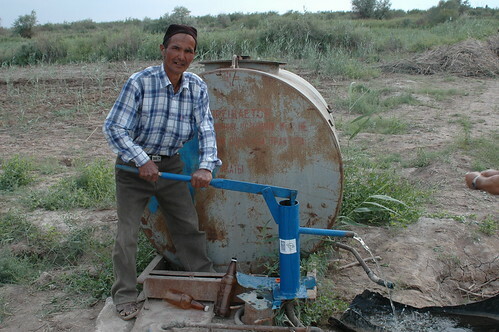 Bakiyev sold water to Kazakhstan during a period of electricity shortages in his own country. Across the region corruption and neglect undermine confidence in government and contribute to political discontent. Water shortages in urban areas large and small agitate communities that are already economically and politically disenfranchised. In border areas in southern Kyrgyzstan, competition over water is an acute conflict trigger. Strategic structures such as dams and pumping stations can also become targets. A clash on 11 January between Kyrgyz and Tajik border guards took place near a reservoir on Kyrgyz territory. If Tajikistan gained control of it, Kyrgyz officials claimed, the Tajik military would be able to cut water supplies to Batken town and the surrounding area. Tajik forces fired mortars at a water pump. Kyrgyz authorities fear this may be just the opener in a series of strikes on strategic water facilities along the disputed border with Tajikistan. As the population along the Kyrgyz-Tajik border grows the risk is greater than ever that a local dispute over resources could rapidly become an international crisis. Alongside the risk that water could become both the means and end of an armed conflict, at a much lower level water-supply and distribution problems feed simmering resentments. In Bishkek, the capital of Kyrgyzstan, Central Asia’s most open country, some 400,000 undocumented residents – internal migrants, poorly educated, often unemployed – are a significant destabilizing factor in a state struggling with stark social divisions. The situation in Bishkek is a microcosm of challenges faced across the region. Despite two decades of donor attention to Central Asia’s collapsing infrastructure, fundamental problems remain. Public and private donors should consider whether some forms of engagement are doomed to failure because of a lack of government capacity and an absence of the will to tackle corruption. Implementing small-scale projects directly with district-level partners can help in bypassing middlemen seeking a cut. The government recognizes the problem, estimating, for example, that up to 70 percent of some $70 million allocated by the Asian Development Bank for water projects between 2000 and 2012 was embezzled. In the interim, the residents of Bishkek’s unplanned suburbs rely on their own wits and initiative. A visit to settlements around Bishkek finds dwellings from slum shacks with plastic sheeting for windows to candy-coloured mansions with heavy gates and high walls. These “new districts” (novostroikas) were built in three distinct waves after the fall of the Soviet Union as internal migration dramatically increased the city’s population and the need for housing. According to the mayor’s office in Bishkek, there are 400,000 undocumented residents in the city of 1.3 million. Many novostroikas were built by city planners but others appeared when internal migrants, looking for work in the capital and unable to find affordable shelter, seized plots of land and started building on them. Land rights and allocation under Kyrgyz law are complex, but according to the Kyrgyz constitution each citizen is entitled to a plot of land to use for agriculture or housing – but only in the place in which they are officially registered to live. Newcomers to Bishkek have no such rights as they are not officially registered as residents of the city. Built adjacent to the city’s rubbish dump, Altyn-Kazyk is one of the poorest of Bishkek’s 48 novostroikas. The government’s refusal to recognize the village means that its inhabitants are effectively second-class citizens. Their lack of official registration means they cannot vote and never appear in a census of the city. They have no access to healthcare and the state will not provide them with infrastructure for water, electricity or transport. After 7 years, Altyn-Kazyk’s residents had electricity installed in 2012 – each family stumped up 5,000 soms ($102) for a private contractor’s fee. The villagers have no access to water and are forced to make multiple daily trips to pumps in neighbouring Kalys-Ordo, each journey taking up to an hour. Even this arrangement proves precarious, as there is often not enough water for Kalys-Ordo’s own villagers, who sometimes close off their pump. Altyn-Kazyk villagers are now in discussions with a company that has quoted $16,000 to drill a well that would provide clean drinking water. “Recently, they didn’t want to give us water for 10 days and we had to hire a taxi to get water from another settlement,” says Nazgul Abdrazakova, a 33-year-old Altyn-Kazyk resident, whom we met lugging two 5-litre containers back to her home. “We went protesting on the main road asking for water channels last spring, but we still don’t have water”. Down rough dirt tracks, we reach the border of Bishkek’s original city plan. On one side of a road is Ak-Bata — no paradise, but it is officially recognised and has water and electricity, albeit no paved streets. On the other side of the road is Adilet, just metres beyond the city’s official border, where 300 residents live in darkness and have to carry their water across the road from Ak-Bata. “Officially they don’t exist, they are dead souls…all the government needs to do is add it on to the other village – it’s just 3 streets,” argues Zamira Sagynalieva of Arysh, a western-funded NGO that provides aid to novostroika residents. The authorities refuse to recognise the village because its land was originally bought for agriculture, Sagynalieva says. The woman who owned it at that time divided it up and, without any official paperwork, sold each plot for 5,000 soms. Officially recognised Ak-Jar has had water since 2011. The pipe provided by the government runs down the main road and originally came out at one central spigot. Since then, the villagers have paid to extend a grid system so that they can each have a pump in their own front yard. The city’s other novostroikas are generally in better condition. In two slightly more affluent settlements, Ak-Ordo-1 and Ak-Ordo-2, residents inhabit clean, reasonably sized houses. They have electricity and many own cars. Even here, water availability is still patchy. Ak-Ordo-1 has had access since its foundation a decade ago, but pipes to each separate house do not work and villagers have to carry water home from a central pump. In Ak-Ordo-2, a pipe was installed only this spring, funded by the residents themselves. Before, they would order large quantities of poor-quality water intended for construction and boil it before drinking. Even now, the pressure is too low for the pump to work in summer. Reforming the arduous waiting system for residency registration and plots of land could improve the situation. For now, Sagynalieva of Arysh has no faith in government and is unequivocal when asked how foreign donors or organisations could help improve novostroika residents’ lives: “They shouldn’t give money for infrastructure to the government, they should do it through NGOs; the government will never get round to building roads and water systems.” A successful precedent for this exists. The Transition and Rehabilitation Alliance for Southern Kyrgyzstan (TASK), a consortium of 15 local and international NGOs, directs EU Commission funding into projects promoting socio-economic development as a means to offset potential security and conflict issues. Last year, the Agency for Technical Cooperation and Development (ACTED), at TASK’s behest, successfully completed a series of infrastructure projects in southern Kyrgyzstan including the construction and rehabilitation of irrigation ditches and bridges. Funding for the projects came from the EU’s Instrument for Stability (IfS) program, which is permitted to work with not only governments but international organizations and the local community among others. The IfS’s broad reach of potential partners makes it responsive and nimble, especially in countries like Kyrgyzstan where government capacity can be limited and slow moving. This article was originally published by the International Crisis Group on 28 January 2014. Alina Dalbaeva is a Researcher at the International Crisis Group.